Every Year in May we celebrate NATIONAL TEACHER DAY and TEACHER APPRECIATION WEEK. It is also common to celebrate and Thank teachers during year-end holiday breaks (like Christmas, Hanukkah, etc.) and Summer break. But we believe that EVERYDAY is a good day to say THANK YOU to a Teacher! Teachers have such a profound impact on our lives and our future. Teachers help us to recognize our potential, discover our passions and to follow our dreams. A compassionate and inspiring teacher is often the catalyst that propels a child to truly realize and explore his/her own personal talents, abilities, and greatness. This book is designed to let a special teacher know that you recognize just how impactful his/her role is in student development. 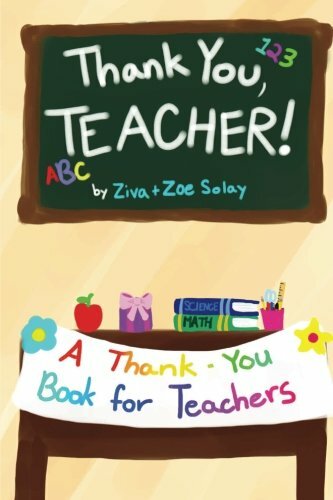 This is a perfect way for parents of students in Preschool and K-8 to thank a special teacher. This is also suitable for High School and College students to use as a Thank You note to a beloved teacher any time of year. Parents who home school and take on the enormous and loving task of double duty should also be recognized. This is a sweet way for one parent to help his/her children to acknowledge and thank the teaching parent for being not only an amazing parent but also an amazing and appreciated teacher. Ziva & Zoe Solay are a mother-daughter writing team. Ziva taught Zoe how to read when she was 3 years old. Ever since then they have shared a love for reading and creating books. Even though they both have written various books for grown-ups, they both knew that the best way to share their passion was to create books that would inspire children to cherish books as much as toys. Their mission is to create memorable stories, activities and images that children will enjoy and remember. In short, they want to inspire children to love reading. When a child loves reading, they are empowered to learn. And with the passion of reading to learn, all things are possible. A child who loves books is empowered with an ignited imagination. And imagination is the fuel that inspires dreams, passions and limitless possibilities.